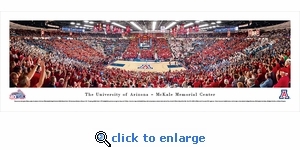 This panorama, taken by James Blakeway, captures the excitement as the Arizona Wildcats defeat the Stanford Cardinal at McKale Memorial Center's 40th Anniversary Celebration on February 6, 2013. The opening of McKale Center in 1973 literally filled the upscale arena overnight and, today, seats 14,500 fans. Arizona has a long and rich basketball history, which came to prominence under former head coach Lute Olson, who took the Wildcats to their first Pac-10 title. From 1985 to 2009, the Wildcats made 25 consecutive NCAA appearances. To date, Arizona men's basketball continues to add to its impressive list of credentials including All-Americans, NBA Draft picks, Sweet Sixteens, Elite Eights, Final Fours and National Champions.